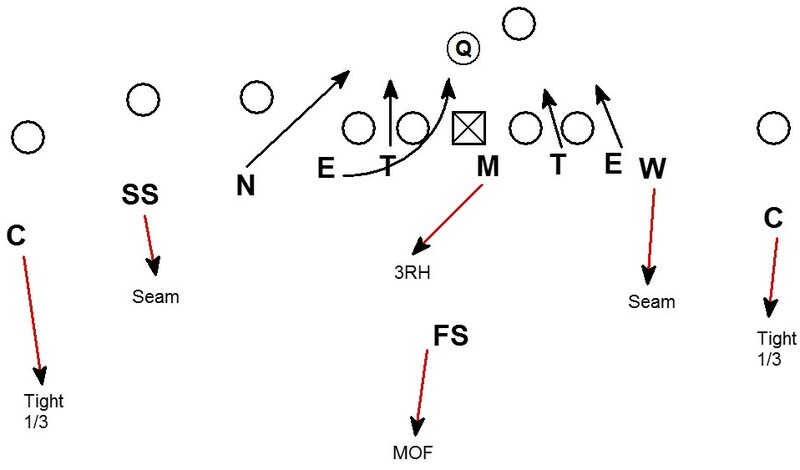 Here is a zone dog rushing the nickel the Atlanta Falcons have busted out several times this season. The bluff of pressure by the Mike and Will linebackers helps control the pass protection of the Center and the RB. Here the bluffing Mike forces the set of the Center away from the pressure. 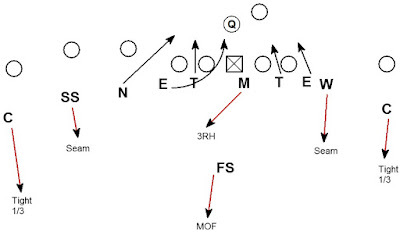 The bluffing Will attracts the block of the RB. The result is a 3 on 2 leaving the Nickel unblocked. Here the offense motions to empty. The Center sets away from the pressure to the initial threat of the bluffing LB's. Again the result is a 3 on 2 with an unblocked nickel. Here the looping DE beats the redirecting guard. The DE pressures the QB into sliding off his launch point in the pocket. The Nickel is accounted for by the TE. The looping DE affects the QB buying time for the Nickel to beat the TE 1 on 1. The pressure has yielded good results for Dan Quinn and the Falcons. Simple & Effective...have to evaluate a Bluff Package!